I am in the planning phase of building a Honda CBX 1000 cafe racer. Nothing too radical; new wheels and a swingarm to accomodate better rubber, a new tail section, a paint job and the loudest six-into-six exhaust system on the planet will just about do it. The internet is obviously the place we all start these days when researching and planning a project. 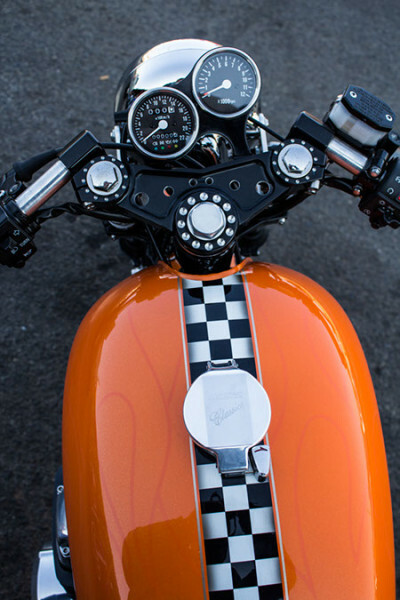 The images of customised CBXs is endless; each version more beautiful or technically intricate than the next. This information overload can however be problematic, stressful and confusing. Building a motorcycle on my tiny budget seems futile when I see what is being attained internationally. I can only imagine the pressure that professional custom builders must feel with every new project. As an amateur builder, I can always use my lack of technical or creative skills as an excuse for any shortcomings in my creation. The professional does not have this luxury. 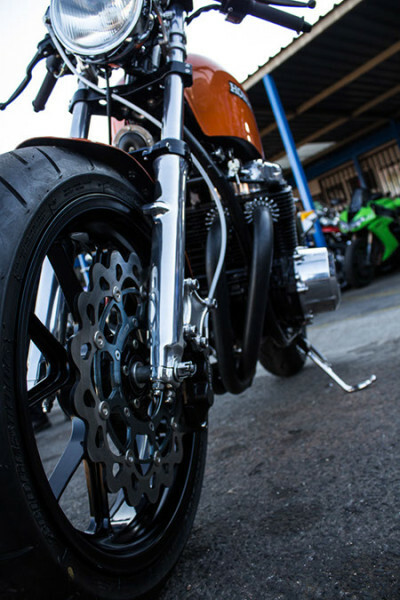 A paying customer, no matter how big or small their budget, is going to expect a certain uniqueness and perfection in their custom motorcycle. Comparisons and criticism are always only a mouse click away. Our featured Honda is the third CB750 cafe racer from KCR in Kempton Park to make an appearance on Retro Write Up. 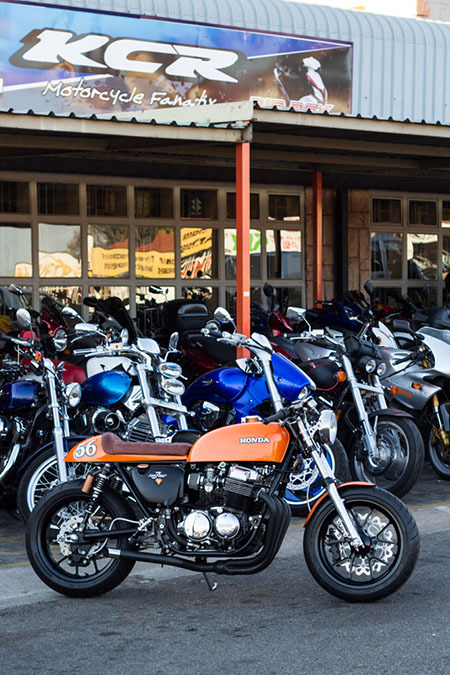 Each one of these motorcycles is unique and world class when it comes to creativity and overall finish. Achieving and maintaining this standard has one down side and that is cost. 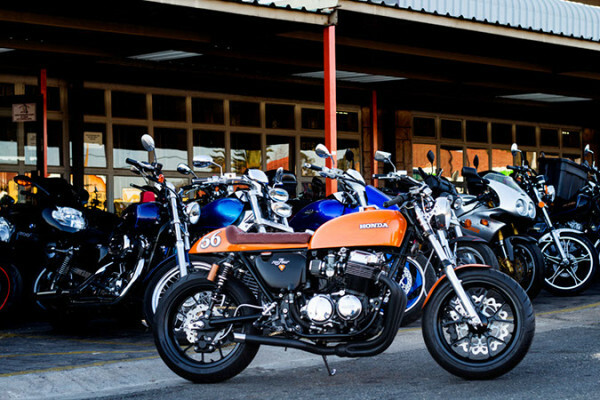 These beautiful motorcycles are very expensive to build. Only the best components are used. Novel ideas require unique custom made parts to become a reality. 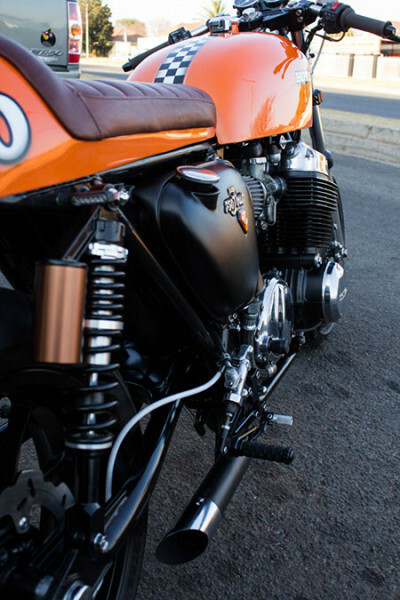 An example of the constant search for uniqueness in a custom creation is this cafe racer’s wheels. Super motard wheels were adapted. These wheels are 16.5 inches in diameter. KCR went to the trouble of modifying the front wheel to fit a 17 inch tyre. 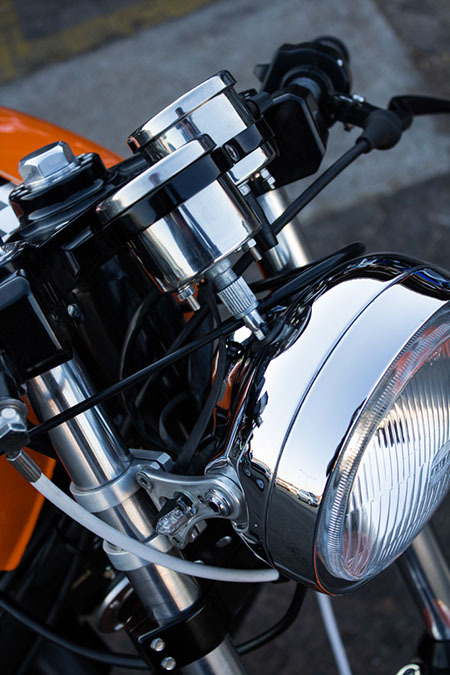 The staggered mounting of the gauges and the stunning CNC cut trees with the clip-on handlebars reflect the quality required to be even considered world class. Suzuki Hayabusa brakes, a GSX swingarm and Yamaha R1 rearsets have been used to upgrade the motorcycle. The one off tail piece and seat combine well with the original side covers and tank. Although the CB750 has been extensively customised, it remains unmistakeably a CB750. 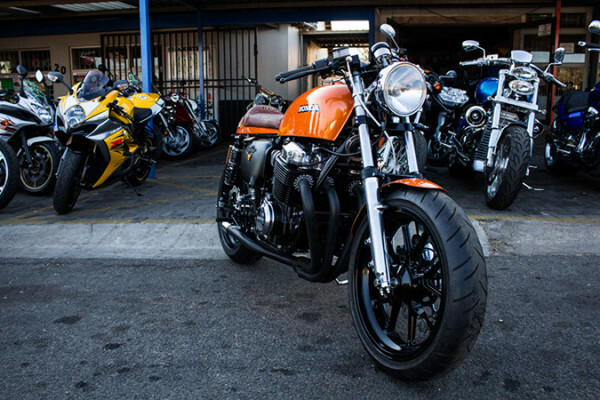 That orange paint and brown seat make the motorcycle unforgettable. For most of us, building a custom motorcycle of this caliber remains an impossible dream. 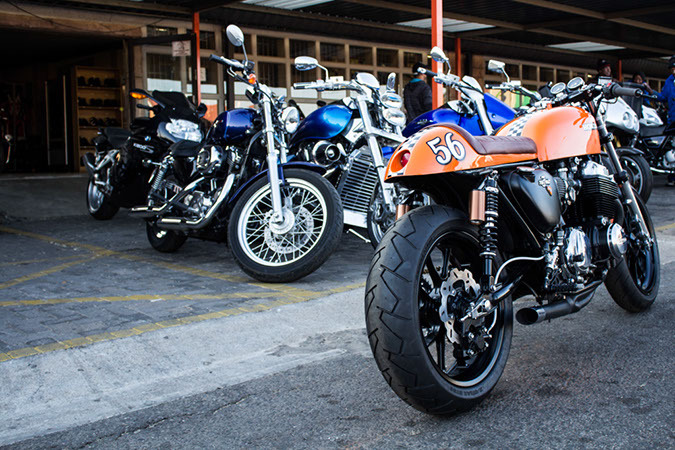 We should however not see these motorcycles as competition for our own more humble creations. Rather gain inspiration from them and incorporate certain elements into our own builds. We, after all, are building a motorcycle for our own satisfaction and to our own standard. Have sympathy for the professional builder who has to satisfy the world.